Vermont offers a huge variety of gravel and class 4 roads. I know the roads in my area very well, having explored them almost every day for years, but there are incredible roads all over Vermont that you only find by being in the area on your bike. Here are some tools I’ve gathered over the years to give you a jumping off point for discovering the amazing roads Vermont has to offer. A quick note: Class 4 roads (or Vermont Pavé, as Peter Vollers dubs them) are unmaintained sections of old town highways. Back in the day, these roads were traveled by horses and buggies to get from rural village to rural village. Today, many of these roads are active off-roading and snowmobiling trails and are perfect adventure routes for cyclists. But watch out in hunting season, because you might get shot! No one knows the roads in any given area better than the local cyclists, and the greatest secrets are always passed along by word of mouth. Never be afraid to reach out to someone via email, social media, or Strava to ask what are the best roads to ride in the area. It’s likely they’ll happily respond with some suggestions or previous routes that they’ve done. Another great way to find new roads is by joining local group rides. These rides usually have a seasoned ride leader, and they’ll expose you to new roads. You can check out our Vermont Group Rides Map, or GroupRides.com to find your nearest riding community. If all else fails, study the races and event routes in the area of your interest. For example, if you pick an area like East Burke or Woodstock and examine the routes Rasputitsa or Vermont Overland promotes each year, that will be a good starting point for an excellent gravel ride. From there, you can fork off the icon event route to other roads, and they’ll likely be good. Vermont is one giant spider web of gravel and it’s hard to go wrong. My favorite route builders are Strava and RidewithGPS. They offer great functionality and shareability. Here are some Strava Clubs and gravel-experts in Vermont. Follow them on Strava or RidewithGPS for new route ideas. Everyone featured on this list primarily rides in Vermont, and tends to be pretty adventurous throughout the state. This app can be an excellent resource for finding the best roads in the area of your interest. If you use the Segment Explore feature, and zoom out, the most popular or most ridden Segments will automatically pop up. It’s likely these segments are heavily ridden for a reason. This is a good place to start as it begins to scratch the surface of the great rideable roads in an area. Try planning a route that hits one or two of these popular segments—people turn themselves inside-out on these roads or climbs for a reason. I bet they have nice views. Another great feature that Strava offers is HeatMap. 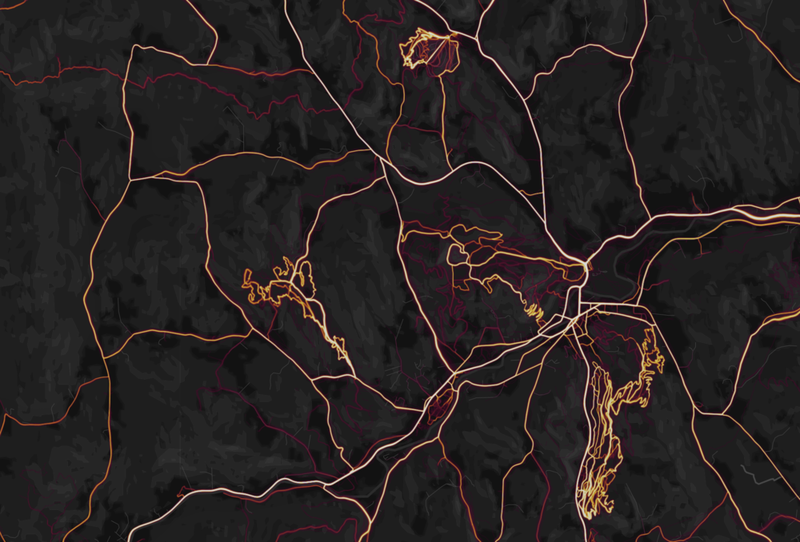 By using this, you can see what roads have been ridden most by Strava users. Obviously it’s not 100% accurate because everyone who rides a bike doesn't use Strava, but it’s another good method of finding new roads and building a great route. You can also use the HeatMap to see where all the local MTB networks are. They show up as the tight clusters of lines that are too close together to be normal roads. It’s another bonus. Seeking Dirt is a fantastic resource to study when planning your next adventure. These guys use MapBox which indexes all the map and geographical data everywhere. It’s pretty cool. These guys have figured out how to display gravel and Class 4 roads as orange, overlaid on a grey map background. The roads pop out at you and enable you to think creatively about how you want to plan your loop or point-to-point expedition. Class 4 roads (the unmaintained stuff like you see in Vermont Overland) show up as orange dotted lines. Given that these roads are by definition unmaintained, it’s always an adventure to ride them—that’s part of the fun of gravel riding and why we love this sport so much. Look at the map, pick a couple of roads you want to explore, and go ride ’em. 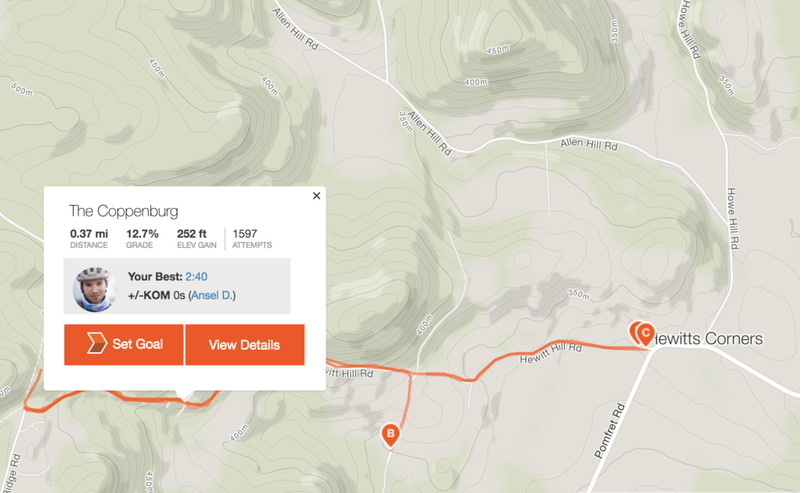 Combining your resources of using info from locals, SeekingDirt, and the Strava HeatMap, you can get a good picture of what’s going on in an area. Important note: Strava HeatMap tends to be more accurate for MTB trails than SeekingDirt, but the latter is VERY accurate as far as distinguishing gravel versus non-gravel roads. This is another great resource that fewer people known about. The crew over at Drummond Cycles pointed me towards it, and it’s great. It’s a mapping program similar to SeekingDirt that indexes and displays all the gravel and class 4 roads of an area. Give it a look. My recommendation would be to start planning your route in Strava or RidewithGPS and have another tab open with one of these gravel apps to give you ideas of what’s a road and what’s not a road. Don’t be turned off by the bare-bones look and clunky-ness to this program—it’s super accurate and a first of its kind! If all else fails you can go old-school and download the VTrans maps from the Vermont.gov Mapping Archive Center. These are comprehensive maps of class 4, gravel and main roads that you can refer to if you’re exploring a remote area. It’s important to note that just because a VTrans map says there is an active class 4 road, it doesn’t necessarily mean it’s still passable. Always ask a local. That adds to the adventure! The greatest thrill you’ll get when riding comes from exploration. It breeds camaraderie and puts you into the here and now. Never be afraid to go down a road you haven’t seen before. It’s likely that it will change you for the better. For more culture, news, routes and dirt-ridden inspiration, join our email list below!